At the well-marked pedestrian crosswalk on S.E. Holgate Boulevard connecting the Holgate Branch Library and Marysville Elementary School, Portland Traffic Bureau officers set up a "Crosswalk Education and Enforcement Action" from noon until 1:30 p.m. on Wednesday, November 28. We saw that frequently, as an anonymous Portland Bureau of Transportation (PBOT) "designated walker" signaled her intention to cross the street, a driver cut her off – sometimes forcing her to leap backward out of traffic. "Pedestrians are not protected nearly as much is a person is in a vehicle; so, when we're sent to a collision between the two, many times, the result is life-threatening," remarked PPB Traffic Division Sgt. Ty Engstrom, while watching the intersection and sitting on his idling patrol motorcycle. "When it comes to crashes between those on foot and cars, there are two sides to the equation," Engstrom told THE BEE. "We're here talking with vehicle drivers about what they can do to be more safe; and also, we're letting pedestrians know what they can do to increase their own safety." 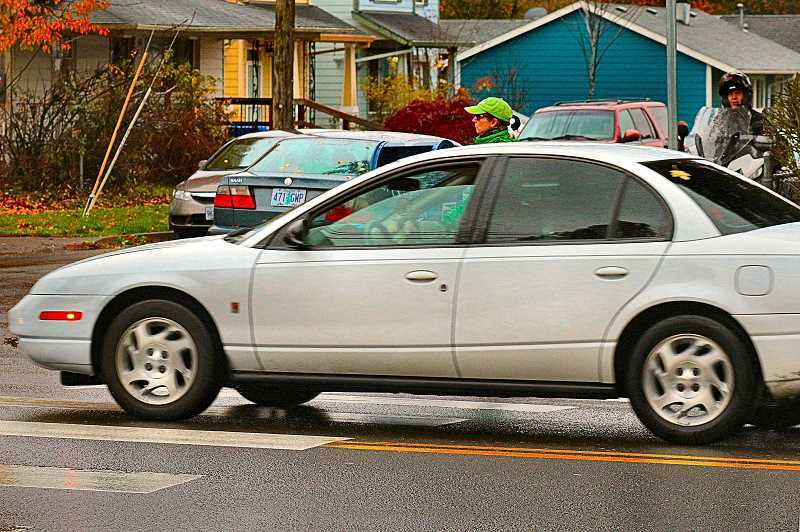 "Whether it is marked or unmarked, every intersection is a legal crosswalk under Oregon law; drivers must stop – and stay stopped – while the pedestrian is in the travel lane, or the adjacent lane," reminded Engstrom. "And, pedestrians should use body language, to let drivers know they intend to cross the street. Added visibility with light-colored or reflective clothing, and crossing at correct locations, will also increase their safety." Right then, the driver of a Honda whizzed past a pedestrian in the crosswalk, and Engstrom pulled out to have a few words with the motorist. Afterward, PBOT Public Information Officer Dylan Rivera reported that a total of 35 people were "educated" during the 90-minute action. "Although 18 citations were written, Safety Education classes were offered to 14 drivers, and three warnings were issued," Rivera said.